Phew! We pulled off another Annual Holiday Boat Parade party. The night was cool (by Florida standards), and the chili was hot. But mostly, we were warmed by having so many friends and neighbors join us at our home. As usual, we cheered on the neighborhood boats as they cruised past our seawall..
We are always in awe and wonder of this event. On nights like the those, we can't help feeling grateful for where our home is. Where we always dreamed it would be. On the water. P.S. We are acutely aware that there is a big honkin' six-month gap between blog postings. We haven't been lazy, just busy dealing with life and the many curveballs it has thrown us in 2011. Details to follow, folks. "There's dolphins in the backyaaard!" is what I heard M. yelling, just as I started rolling down the driveway. Say what?! I dropped my bike and sprinted around the house in time to see a two smooth silver dorsal fins breaking the surface just a few feet from our seawall. Since one fin was mucho tinier that the other, we think it was a mom/baby pair. Aww. In three years living at PMH we hadn't been so lucky as to see dolphins, since neighbors had told us it was a rare treat. Indeed. So great was our shock and aww at seeing the dolphin family that it delayed my thinking... Pictures! Must get pictures! Unfortunately for our camera, dolphins swim fast and they were quickly out of range. We gotta be quicker on the draw next time. Hope everyone had a wonderful, relaxing, and safe holiday weekend. 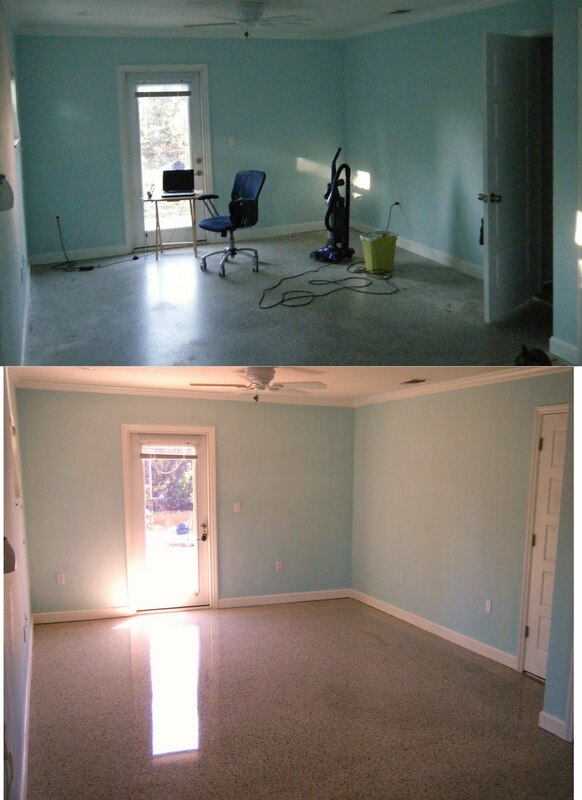 Here's how our terrazo floors went from terrible to TERRIFIC in two days. [Too rushed to read our harrowing tale? 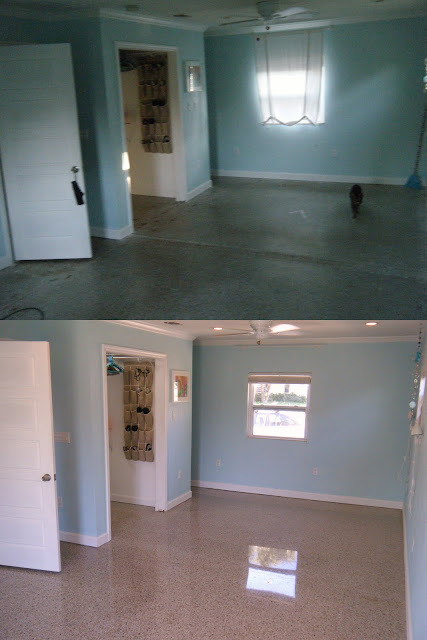 scroll down for before & after pics] When we first saw our house, we were initially horrified that the freshly laid travertine tile floors only covered the main living areas, leaving the back 2 bedrooms with severly damaged terrazzo. Perhaps the previous owner was gonna put carpet in those rooms, but we didn't want that for us. Unfortunately, most commercial carpets contribute to poor indoor air quality because they off-gas chemicals and retain allergens (pets, dust, etc.). Although the best eco-option is usually to use what ya got, our terrazo floors were full of paint stains, deep gauges, nails, holes, and scratches. 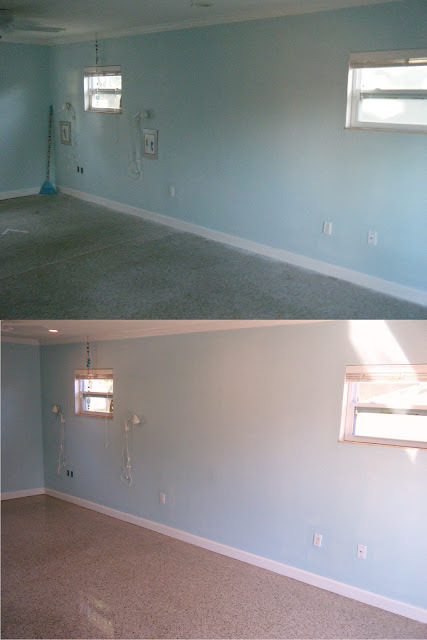 Unsure if the floor was beyond repair, we called up a professional restoration company. Yikes - very pricey! So then we looked at the prices of just getting NEW terrazo installed ($25 to $50 per square foot). Double Yikes! Then, we contemplated alternative flooring: M wanted cork flooring and I wanted bamboo. But as the years went by, our indecision defaulted to NO decision. Finally a few months ago, I surrendered to M's idea of cork flooring tiles. But even as we celebrated our unified decision making, there was this nagging feeling that by covering up the terrazzo, we would forever lose a part of our home's history. Ya see, in the 1960s (when our house was built), terrazzo was all the rage in Florida housing developments. Terrazzo - essentially a mix of tinted concrete embedded with colored stones - was poured directly over a foundation pad, then walls/framing were built on top. Umm...pay no attention to the messiness in the "before"...haha. So, what's with our love for Terrazzo? When restored, terrazzo shines like a new nickel. Being highly reflective, it bounces light all around, looking clean and glossy...ahhh. If we have one regret, it's that we waited waaaay too long to complete this project. Perhaps if we had bothered to call more than one professional restoration company way back when, it wouldn't have taken so long. Sheesh. And moving furniture out of bedrooms, having your dressers and nightstands end up in the living room is not our idea of fun for a weekend. 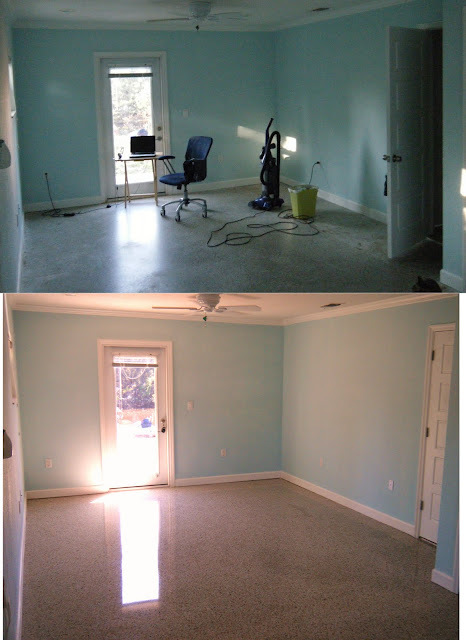 But now we are luvin' our floors. Even the cat likes it - and she is one fickle feline. And the award goes to...well, apparently us?! Aww, shucks. We were smitten as a kitten to be awarded a place of honor on this list of Top 50 Green Construction blogs. Thanks for thinking of us, and we hope to live up to that honor. We have spent the past 3 years working hard to make our home a lil' greener, and it hasn't exactly been a glamourous process. Looking at this list just makes us say "Whoa! So that's what happened to our weekends for the past few years?!" Yup, it explains so much. We expect many more projects for 2011 (and beyond) to keep our weekends busy. We promise to keep the posts and projects coming. Call us crazy, but we love to share the oopsies, the ouchies, and the finished work with you. The post title is a quote from one of our favorite movies...we just couldn't resist. On the day of our 3rd annual backyard holiday boat parade party (say that ten times fast! ), the neighborhood association announced the parade cancelled due to looming rainstorms. Later that day, they declared the parade was back on. Apparently, not everyone got the memo; only about a dozen boats turned out (compared to 22 last year). But we partied on with friends and neighbors. Christmas Eve was a quiet dinner for two, followed by a local concert and staying up past midnight for gift opening. On December 25th, it was M's birthday, and my first gift to him was to let him sleep in as long he wanted...zzz...this resulted in having to postpone our Orlando trip until the following day. For his birthday, I took him to The Wizarding World of Harry Potter at Universal Islands of Adventure theme park. He didn't mind the delay, even though it meant much cooler weather that day. 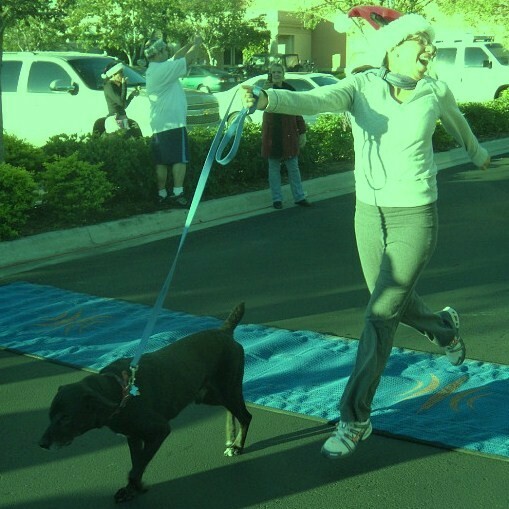 On December 20, 2010, we lost a four-legged family member: Elmo. He lived here at Pacha Mama House for many months, impishly eating our socks and fervently protecting us from the FedEx guy. He is already very much missed. Each step of the way." About a year ago, Elmo and I ran a 1-mile charity race known as The Jingle Run; it's a fundraiser for the Arthritis Foundation. Back then, I didn't know that canine Arthritis and Cancer would slowly steal Elmo from our family. If your life has ever been touched by a dog, you know that they teach us, far more than we can teach them. Elmo was a teacher of loyalty and joy. And we were lucky to be his students. For many weeks, it sat awaiting the completion of House Project #852: hand-sewn custom curtains to frame the sun-streaked kitchen window. The bare window just taunted me, daring me to cover it up. Ahh. Another successful reuse, upcycle, or whatever you want to call it. I call it completion of House Project #852. She's the inspiration. He's the perspiration. mermaid? manatee? Gordita our cat! <!-end of code--> Do we tire of Florida weather? Nope. Wondering what you else you can recycle? You'd be surprised. We were! In Andean culture, Pacha Mama means "Mother Earth" from the Aymara-derived PACHA (earth) and Quechua-derived MAMA (mother). Pacha Mama is also known as the generous goddess of earth, agriculture and harvest. Pacha Mama House was named for J. & M.'s attempt to makin' it a lil' greener.